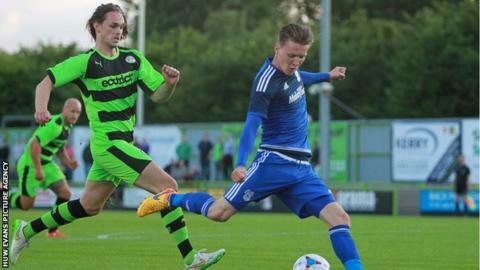 Cardiff City were held to a draw at Forest Green Rovers in their pre-season friendly on Wednesday. Joe Mason gave the Bluebirds the lead after being picked out by Craig Noone. Mason then won a penalty but Peter Whittingham's spot-kick was saved by Jonny Maxted in the Rovers goal. That proved costly for the Championship side as Aaron O'Connor - the former Newport County striker - rescued a point for the Conference side with a well-placed header. Russell Slade's Cardiff side now play Shrewsbury on Saturday, before heading to the Netherlands for a training camp. Whilst there City face Israeli side Hapoel Ironi Kiryat Shmona and Sparta Rotterdam. They complete their pre-season with matches against newly promoted Premier League sides Watford and Bournemouth. Cardiff kick-off their Championship campaign at home to Fulham on Saturday, 8 August. Cardiff City First Half XI: Moore, Peltier, Morrison, Connolly, John, Ralls, Dikgacoi, Pilkington, Kennedy, Revell, Macheda. Second Half XI: Wilson, Fabio, Ecuele Manga, Ajayi, Oshilaja, Noone, Whittingham, Southam, Ralls, Doyle, Mason.